This is College Physics Answers with Shaun Dychko. 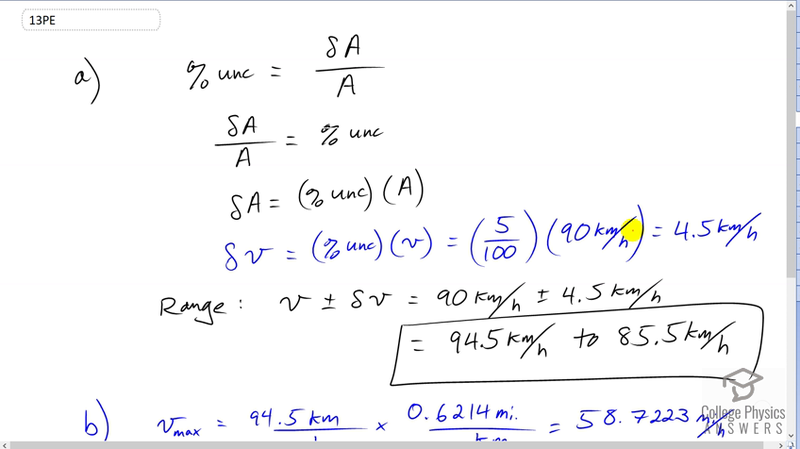 Our job in this question in Part A is when the car speed is 90 kilometers an hour according to the speedometer and the uncertainty in that speedometer is 5%. Our job is to find out within what range does the true speed of the car fall. So, we know from the textbook formula that percent uncertainty is the absolute uncertainty divided by the measurement. And absolute uncertainty is, you know, if we have kilometers per hour in our meaurement for the speedometer then the absolute uncertainty would be the number of kilometers per hour that... that creates this range within which the true value would fall. We're gonna switch the sides around because our job here is to find delta <i>A</i> and then, we'll add that and subtract it to the measurement to find the range. And... And at this point, we'll multiply both sides by the denominator <i>A</i>. Then, it cancels in the left and shows up on the right, leaving us with this line here. And... we... Instead of using the letter <i>A</i>, let's use the letter <i>v</i> because we're dealing with speed or velocity. And so, the absolute uncertainty in the velocity is the percent uncertainty times the measurement of the speedometer. Now, 5% should be written as the number 5 divided by 100. Every percent can be written as the number divided by 100. And multiply by that by 90 kilometers an hour gives us 4.5 kilometers per hour. It's the absolute uncertainty. So, the range. Our first speed will be the speed shown on the speedometer plus or minus the absolute uncertainty. So, that's 90 kilometers per hour plus or minus 4.5 kilometers per hour, giving us a range of 94.5 kilometers an hour to 85.5 kilometers per hour, that is, the true speed of the car falls somewhere within this range when the speedometer says 90. And converting these into miles per hour, we'll take the maximum speed of 94.5 kilometers per hour and multiply that by a conversion factor that makes the kilometers cancel. And so, we want kilometers in the bottom of those conversion factors so that they cancel with the kilometers in the top of our number that we're starting with. And we want miles in the top so that we're left with miles per hour. And there is .614 miles in every kilometer and this is 1 kilometer. You always assume it's a number one there if no number is written. And so, we have 94.5 times .6214 is 58.7223 miles per hour. And then, likewise, for the minimum speed, we have 85.5 kilometers an hour times that conversion factor giving us 53.1297 miles per hour. And so, the range in miles per hour is 58.7 miles per hour to 53.1 miles per hour.